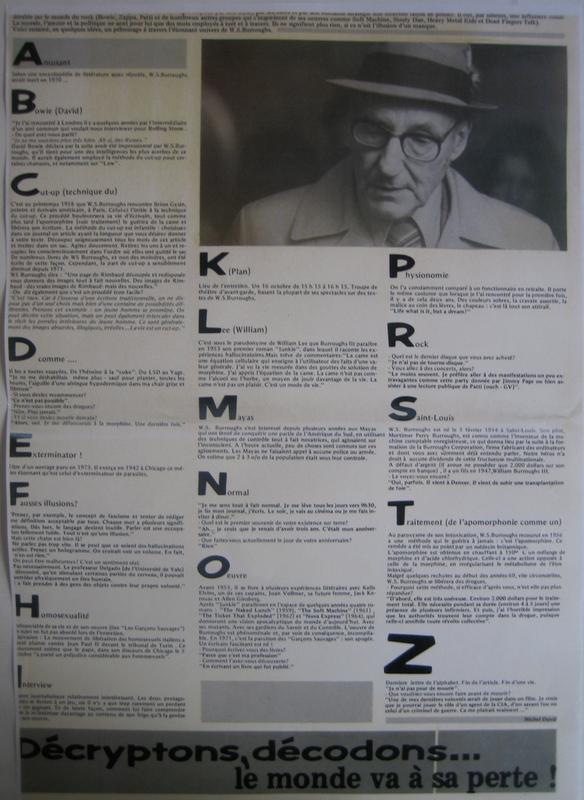 This interview with William S. Burroughs, which has never been reproduced since appearing in the November 1979 issue of En Attendant, was conducted on the occasion of the Plan K gig on 16 October 1979. It appears here in conjunction with RealityStudio’s dossier on William S. Burroughs and Joy Division. You can also read the original French version. What did you speak about? Afterward David Bowie claimed to have been impressed by Burroughs, whom he considered one of those most incisive minds in the world. Bowie would also employ the cut-up method for certain songs, notably on Low. In the spring of 1958 Burroughs encountered Brion Gysin, an American painter and writer [Gysin was born in England and raised in Canada — ed. ], in Paris. Gysin introduced him to the cut-up technique. This procedure would revolutionize his life as a writer, much as apomorphine would cure him of his addiction and liberate his writing. The cut-up method is child-like: choose a newspaper or article the length you want for your text. Carefully cut out the words and put them into a bag. Shake gently. Pull them out one by one and scrupulously copy them out in the order you remove them. A number of Burroughs’ books — and not the least ones — were written in this manner. However, the cut-up portion has sensibly diminished since 1971. Can’t it also be said that the process is too facile? “That’s false. It’s the opposite of traditional writing, you don’t have a single choice but hundreds of different possibilities. Let’s take an example: a young man goes for a walk. You can describe this situation, but you can also intersperse in the story the young man’s interior thoughts. These are generally absurd, illogical, unreal images… Life is a cut-up. Do you still take drugs? What if you were to die tomorrow? Then, yes. I’d load up on morphine a last time. Title of a book published in 1973. In 1942 in Chicago Burroughs performed the astonishing work that is the extermination of insects. “Take, for example, the concept of fascism and try to formulate a definition acceptable to everybody. Each word has a number of meanings. For that reason, language becomes useless. To speak is a futile endeavor. It’s all an illusion. But this chair really exists? Can one be unhappy? That’s a real feeling. Inseparable from his life and work (read The Wild Boys), this subject didn’t come up in the interview. Relatively uninteresting genre of journalism. The two protagonists play a game where there is rarely a winner or a loser. And besides, how could I convey to him that I’m more interested in the contents of his fridge than in the origin of his work? Where the interview took place. 16 October (1979) from 3:15 to 4:15. Avant-garde theater group basing most of its productions on texts by Burroughs. For a number of years Burroughs has been interested in the Mayans, who attempted to conquer a part of South America using completely new techniques of control that act on the unconscious. Currently little is known about how these techniques work. The Mayans did not have recourse to any police or army. It is estimated that 2-3% of the population was under their control. Nowadays what do you do on your birthday? Before 1953, Burroughs lent himself to several literary ventures with Kells Elvins (one of his friends), Joan Vollmer (his future wife), Jack Kerouac and Allen Ginsberg. After Junky, four novels appeared in a period of a few years: The Naked Lunch (1959), The Soft Machine (1961), The Ticket That Exploded (1962) and Nova Express (1964), which offered an apocalyptic vision of today’s world. With its mutants. With its guardians of Knowledge and Control. The work of Burroughs is phenomenal and, in consequence, uncompromising. In 1971 The Wild Boys, his apogee, appeared. A fascinating writer is born! He is constantly compared to a retired bureaucrat. He wears the same outfit as when I met him the first time, a few years ago. Somber colors, knotted tie, malice at the corner of his lips, hat — that’s his entire wardrobe. What is the last album you bought? Do you go to concerts? Burroughs was born February 5th, 1914, in St. Louis. His father, Mortimer Perry Burroughs, was the inventor of the adding machine, which would give rise to the formation of the Burroughs Corporation, a company manufacturing computers and of which you’ve surely heard. [In actuality it was Burroughs’ grandfather, William Seward Burroughs I, who invented the adding machine. — ed.] Our hero has no right to receive dividends from this successful multinational corporation. In the absence of money — he claims to possess no more than 2,000 dollars in his bank account — Burroughs had a son in 1947, William Burroughs III. Do you still see him? At the height of his addiction, Burroughs turned in 1956 to a method that would cure him forever: apomorphine. This cure was administered by an English doctor. Apomorphine is obtained by heating to 150 degrees centigrade a mix of morphine and hydrochloric acid. This has the effect of countering the morphine and re-regulating the metabolism of the addict. In spite of a few quickly cured lapses in the beginning of the 1960s, Burroughs freed himself from drugs. How come this cure, which you declare so effective, isn’t more widely used? “In the first place, it’s very expensive. About 2,000 dollars for the whole treatment. It requires the presence of several doctors the whole time (about 4 to 5 days). And then, I have the horrible impression that the authorities don’t really mind drugs, since they oppress any collective revolt. Last letter of the alphabet. End of the article. End of a life. What would you still like to do before dying? Published by RealityStudio on 29 May 2008. Interview originally published in En Attendant, Number 22, November 1979, Brussels. Translation by RealityStudio. Many thanks to Michel Duval for providing a copy of the interview.